And then it happened. Something so strange, Daniel wasn’t sure he could believe his eyes. One little cracker lifted up off the table. Not much Not even an inch. Then just as suddenly, it dropped right back down. Donald blinked. Had that really happened? How? Had he done it? Up is the story of an ordinary boy with an extraordinary talent, a talent no one knows about, but him. Can Mouse really lift things off the ground? Or is it enough that he believes he can? Once again Jim LaMarche has mixed the magical with the everyday to create a book that stretches our imaginations and our dreams. Why I like it: The beautiful large pictures drawn in soft pencil and dashes of water-colour are life-like, show great expressions and capture the eye. I love these kinds of illustrations most. 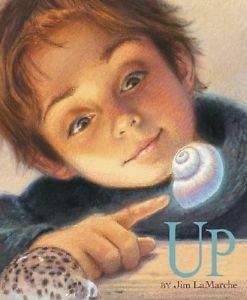 This is a soft sweet story of a boy who wishes everyone would not treat him as a little boy. The reality of his secret power is weaved into the story so that only he and the reader know about it. When a beached whale is needing help, no one believes or even notices the whale lifts upwards and slips into the sea, believing they did it all themselves. I love the fact that Jim brought the story round to the beginning in just a couple of sentences. This is the second book he has both written and illustrated, having illustrated many others and winning world-wide acclaim. Here is a wonderful insightful up close and personal interview with Jim, and talk about up close and personal with his to-die-for illustrations …. http://www.chroniclebooks.com/landing-pages/pdfs/Up.pdf *sigh* I love pencil drawings. This entry was posted in Children's literature, Picture Book Review and tagged Children's Picture book, Jim LaMarche, Perfect Picture Book - Friday, Susanna Leonard Hill. Bookmark the permalink. The illustrations sound lovely and so does the story! I love the idea of a boy having a secret power. This is a great book. I was fortunate enough to see some of Jim’s original illustrations at our local museum a few years ago. Absolutely breath-taking! Thanks for the interview link. I can’t wait to watch it. Jim’s art for Rainbabies has always been one of our favorites. Oh wow! you actually saw his original illustrations, how cool! I think you will enjoy the link, Joanne. Oh- I’ve always wanted a super power—levitation would be amazing. Sensational resources…especially the interview. I’m envious of Joanne for seeing the original illustrations…will definitely check this one out – love the looks of it. Thanks for sharing, Diane. You are very welcome Laura. Glad you liked the resources as well. Yes, it would be kind of magical to have some sort of super power, wouldn’t it. Imagine all the mischief we would get up to…hehe! I love Jim Lamarche’s work! This is a great choice, Diane. I always wanted a nickname but never had one, I never thought about the reverse point of view. Thank you, Wendy. Hmmm… I had a nickname when I was young, but only my Dad called me it. After a fashion model from way back. This book interests me because I’m interested in how the author uses fantasy. It sounds like a beautiful book and the illustrations look captivating. I clicked on his website and saw some other interesting books. I don’t think I’ve read Jim Lamarche’s work before. Thanks for sharing. Yes Pat he has illustrated many other books. All very beautiful. He’s only written a few books himself. Enjoy! this looks fun… I always wanted magical powers when I was a kid. Never saw this book before, so thanks for sharing it. lol… another who would love magical powers. The book is beautiful. Thanks Sue. I really liked the soft glow of this book too. 🙂 Imagine if we had some super powers, Joanna? Oh, this looks positively magical! The pictures seem almost luminescent. Very interesting. Thank you Kirsten. I think you would enjoy it. It is, Erik! Just imagine what it would be like if you had super powers… hehehe! I hope our library has this one. Thanks for sharing it. It looks great. Well, that’s interesting. I didn’t see a hardcover book, but was able to put a ebook on hold! I will be able to read it soon! wow I had no idea it was in ebook. Enjoy Stacy! Sounds like a magical story about being brave or having self-faith that I’d love to read. The kind of illustrations is right up my alley, too. Yep, it is that. Glad you like it. The illustrations are gorgeous. Thanks for stopping by. I LOVE Mr LaMarche’s books! His artwork glows with wonder. This looks like a good one. Thanks for sharing!